There is nothing that bonds a family together other than real love and for one of Nollywood’s former couple, Saheed Balogun and Fathia Williams, their offspring will always bring them back. 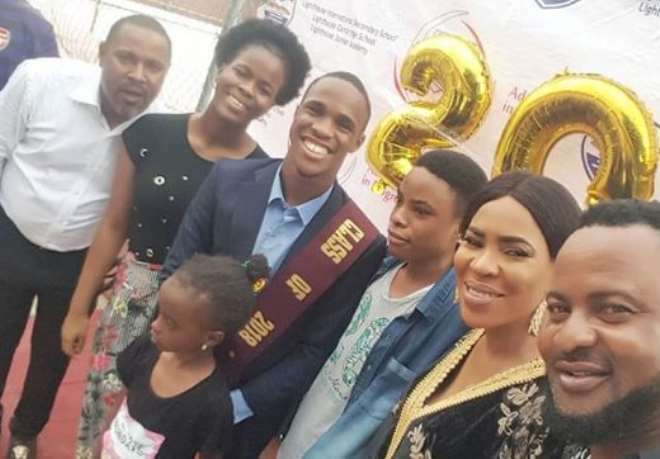 Saidi’s son, Khalid, whom he had with Fathia, recently turned a year and not just that, he also graduated in his school as he warms up to joining his colleagues at the university. The celebration of his graduation saw the two ex-lovers coming together to celebrate their son who has brought them nothing but joy. Despite the marital issues they have had together, the two love birds have continued to show maturity whenever they are in public as they still cannot hide the affection they have for each other.